This last week has been a rough one. On Wednesday I was in a car accident while on my way to work and every day since has been all about sleep, doctors, Advil, and ice packs. Although my accident was not very serious, I have been unable to work for the last three days and spent almost every minute that I wasn't sitting in a waiting room, in bed and in pain. A big reminder of how quickly life can change. I recently found this old post on Anna Maria Horner's blog and decided that a blanket made of flannel and voile sounded like the perfect gift for a little person. 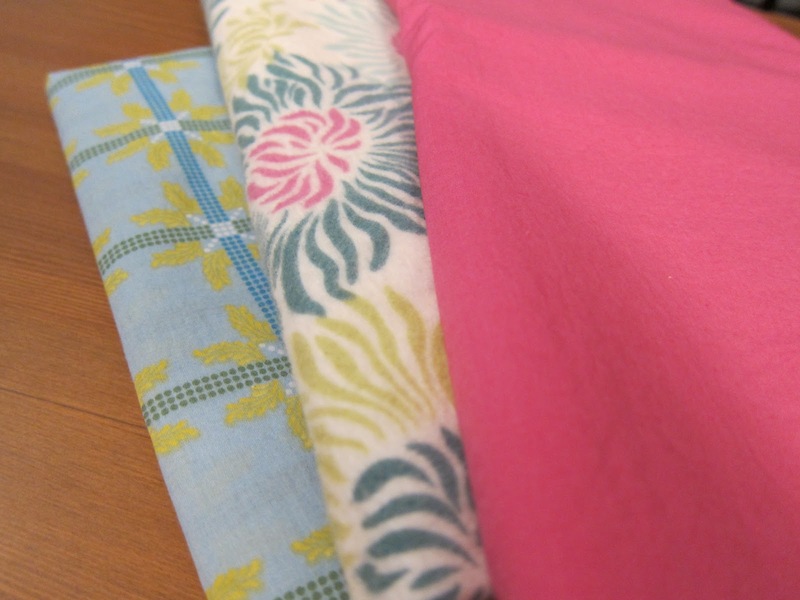 I purchased some Anna Maria Horner voile and some Heather Bailey flannel from Fabric.com back in February. I wasn't sure how to tackle Anna Maria's suggested voile bias binding. I did some poking around the internet and found this video demonstrating a great technique for cutting bias binding strips. That plan got derailed when I was walking around my local fabric store and stumbled upon some satin blanket binding and remembered how the thing I loved most about blankets as a child was rubbing the satin binding against my skin while lying curled up in bed. I found some soft baby pink binding and bought enough to bind this blanket. I've never worked with satin blanket binding before and I can definitely say that it was slippery. Making the mitred corners was also a little awkward. To add to the challenge, I ended up using my grandmother's sewing machine that I haven't really used since I was a child. If I do this again, I would definitely use a walking foot to keep the top layer of binding in place as I kept ending up with extra binding fabric on top. The finished blanket ended up at about 36" by 41". Although it's not perfect by any stretch of the imagination, I am still happy with how this little number turned out. The flannel is so soft and warm and the voile is smooth and cool. I definitely want to cuddle up with this number and I hope that the blanket's intended recipient feels the same. That's one of my summer hit list projects out of the way. Expect another early next week!